The linear accelerometer measures the acceleration applied to the sensor built-in into the device, excluding the force of gravity, in m/s². For example, you could use this sensor to see how fast your car is going. The linear acceleration sensor always has an offset, which you need to remove. The simplest way to do this is to build a calibration step into your application. During calibration you can ask the user to set the device on a table, and then read the offsets for all three axes. You can then subtract that offset from the acceleration sensor’s direct readings to get the actual linear acceleration. 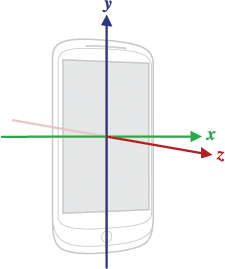 The coordinate-system is defined relative to the screen of the phone in its default orientation (facing the user). The axis are not swapped when the device’s screen orientation changes. The X axis is horizontal and points to the right, the Y axis is vertical and points up and the Z axis points towards the outside of the front face of the screen. In this system, coordinates behind the screen have negative Z axis. Also, the natural orientation of a device is not always portrait, as the natural orientation for many tablet devices is landscape. For more information, check the official Android’s Sensor Coordinate System documentation. Aware_Preferences.STATUS_LINEAR_ACCELEROMETER: true or false to activate or deactivate accelerometer sensor. Aware_Preferences.FREQUENCY_LINEAR_ACCELEROMETER: non-deterministic frequency in microseconds (dependent of the hardware sensor capabilities and resources). You can also use a SensorManager sensor delay constant. LinearAccelerometer.ACTION_AWARE_LINEAR_ACCELEROMETER: new data recorded in provider. LinearAccelerometer.EXTRA_DATA: the recorded data, as ContentValues. LinearAccelerometer.ACTION_AWARE_LINEAR_LABEL: assign label to the recorded data.